flatten each slightly with a meat tenderizer. Put melted butter in a large bowl. with the bread crumb/cheese mixture. (Kids especially love this dish. drain well and transfer to large bowl. Add tomatoes, oil, vinegar and olives. Toss to blend. Let stand until cool. cheese and garlic into orzo mixture. and serve with pitas or fresh vegetables. Now share you favorites below! love to make at your home. This is fun. Thanks for hosting. My gazpacho recipe is perfect since tomatoes are in full force right now. :D The chicken recipe will be put to good use around here soon. It sounds fantastic!!! Thanks for hosting, Alison. Oh yum! I must try that Greek orzo salad, have had something similiar and loved it, make those chicken breasts, a favorite of my kids. Thanks for sharing! They all look delicious... I'll definitely be trying the parmesan chicken. Yum! They sound wonderful! Thanks for sharing and hosting. i made an orzo salad last night, and this one sounds like a winner. i'm gonna link up my recipe for macarons even though this is not something i make very often! Hi Alision! Thanks so much for hosting this DELICIOUS linky! All three of your recipes are winners... but I must try your Greek Orzo Salad. LOVE Greek flavors! Please stop by ON THE MENU MONDAY and share these recipes with us there! Link goes live each Sunday evening! I would like to put your greek salad on my menu next week. Could I use your picture with a shout-out and a link back to this post? Let me know! OH YUMMY! Now I am off to visit all the creative culinary party animals! Thanks for sharing, I will definnately be giving these a try. Sounds like a great Summer meal. Your Greek Summer salad looks really good. Thank you for hosting. I dont think you can go wrong with cheese and butter. The orzo salad looks great. I make a similar with Gemelli pasta. Thanks for visiting my blog. The fish fritters were wonderful. I'll blog the recipe for a post next Tuesday (the 7th) so you can have the recipe. FIRST: You look gorgeous dear Alyson in your new pic!! I don't have any food posted today, because right now this is my favorite thing I just found!! I wanted to share with Favorites on the 1st. I love the chicken recipe and orzo salad. I'm going to check the other recipes now! Alison, all three look delicious. Can't really have just one favorite. The chicken will go on our menu this week. Thanks for hosting each month. It's a favorite! Alison, thanks for hosting this! I think I better print all the recipes and start a Favorites mini cookbook. They would be welcome on my menu. Wow, I can't believe it is the 1st already! This summer is just blowing by! I have to try that parmesan chicken. I think my kids would love it too! Thanks for hosting today! Thanks so much for hosting this fun party. Your favorite recipes look so yummy. 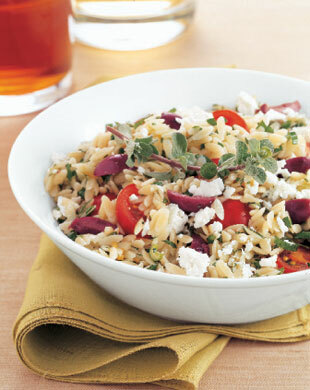 Can't wait to try the Greek Orzo Salad. They all sound yummy. I might just have to take pictures tonight of our meal so I have something to link. The Parmesan Chicken, Orzo and humus sound wonderful. I hope to get lots of new recipe ideas from this party. Thanks for hosting. What fun, Alison! I love recipes and thanks for hosting. 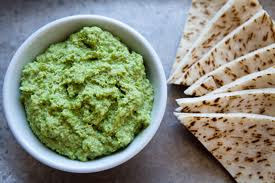 Thanks ALison that edamame hummus is a nice change to chickpeas....though I'm a chickpea nut! I'm your newest follower :). Thanks for your sweet comments. Your choice of favorites look yummy! I have to try the Edamane Hummus. Love hummus! 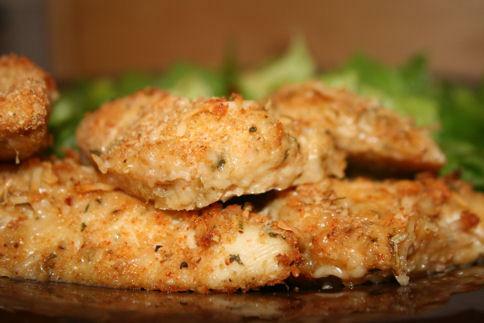 Those Parmesan chicken tenders looks really good. I'll make these for sure. I'm always looking for new, quick chicken recipes. Yum!